Although there's a misconception that Christianity has a monopoly on saying a prayer over food and drink, many religions celebrate the consumption of food with some sort of prayer of thanksgiving. The practice most likely originated with the classical Greeks. Author Maria Bernardis says in Cooking & Eating Wisdom for Better Health, "Cooks... were versed in sacrificial [rites] and understood the spiritual connection of food to life and the gods. They prayed for safety, health, and blessings for all ... [as] part of the cooking and eating process." Interestingly, in the early Hebrew scriptures, there's no reference at all to meal blessings. In fact, the idea that food was unclean would have been abhorrent and disrespectful to God; after all, if He created all things, then food was already holy and sacred simply by virtue of being one of God's creations, and blessing it would not have been necessary. Jamie Stringfellow of Spirituality & Health says there may have been a more practical application of the practice of meal blessings. "Theologist Laurel Schneider, the author of Polydoxy: Theology of Multiplicity and Relation, said that in the time before pasteurization and refrigeration, “blessings may have been part purification (we pray that this food will not mysteriously kill us)” along with simple gratitude and the practice of “pleasing God/the spirits/the ancestors.” Acknowledging, she says, that the food “is not ours to begin with, but loaned to us” by those entities keeps us humble and in proper harmony." Many Pagans today believe that not only should we thank the gods for our food, but also the earth and the food itself. After all, if you're eating plants or meat, something had to die so that you could have a meal. It seems rude not to thank your food for its sacrifice. Any of the following may be said over a meal, a Cakes and Ale ceremony, or any other event where food is served. Feel free to include the names of the deities of your tradition, of you prefer. Use this prayer as a very basic mealtime blessing, expressing your gratitude to the god and goddess of your tradition. You can use "Lord and Lady," or substitute the specific deities that you honor in your belief system. If you'd like to keep things basic, and not call upon specific deities, you can thank the earth and all of its bounty instead. If you're a carnivore, whatever is on your table probably once roamed around on hooves or feet, or it swam in the water or flew through the skies. Thank the animals that have provided you with sustenance. 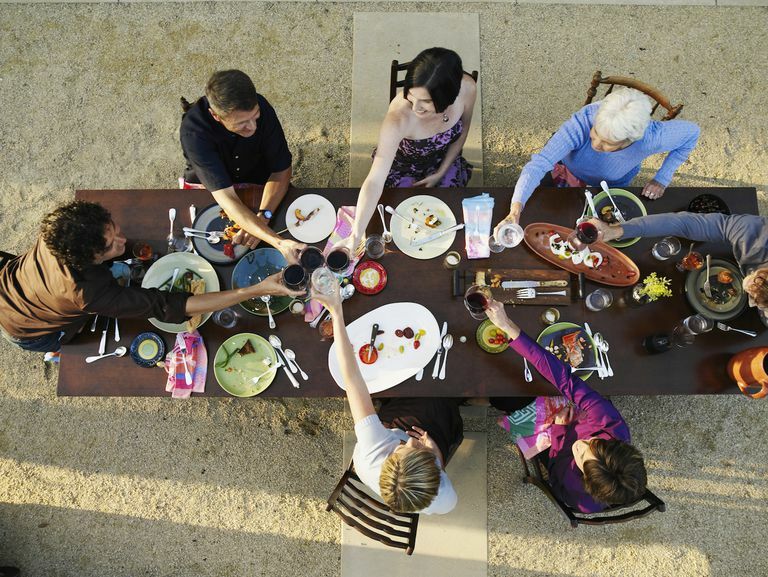 If you'd like to invite the gods and goddesses of your tradition to join you at mealtime. set an extra place at the table for them. The Secular Seasons website suggests some really lovely humanist versions of mealtime blessings. This can come in very handy if you've got guests at your table who are not Pagan, and you want to show them hospitality by not making them uncomfortable. "Throughout history, people of all different cultures and religions have paused before a meal in order to express gratitude for the nourishment food provides. This practice not only leads to a more present and enjoyable eating experience, but also helps us appreciate the great communal effort that goes into growing, harvesting, and preparing each ingredient."